Autumn brings us glorious color changes. This season’s outdoor weddings feature fantastic shades of crisp apple, golden brown marshmallow, dandelion yellow, deep plum, and smoky orange. Gold accessories beautifully complement the colors of fall. Whether your wedding theme features neutral tones, rich harvest colors, earthy gem hues, or rustic-chic patterns, a bit of sparkle adds subtle glamour to your celebration. 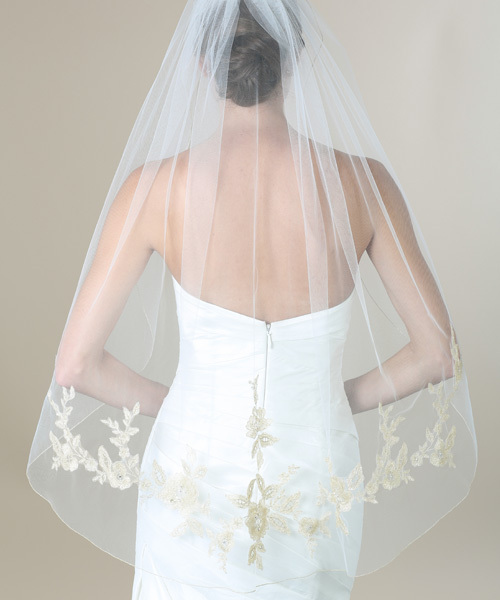 This week, we’re featuring our metallic lace veils that look especially gorgeous in gold. Feast your eyes on this radiant display, and pick your favorite! Add effortless charm to your bridal ensemble. Style V7281 blends graceful design with rich embroidery. 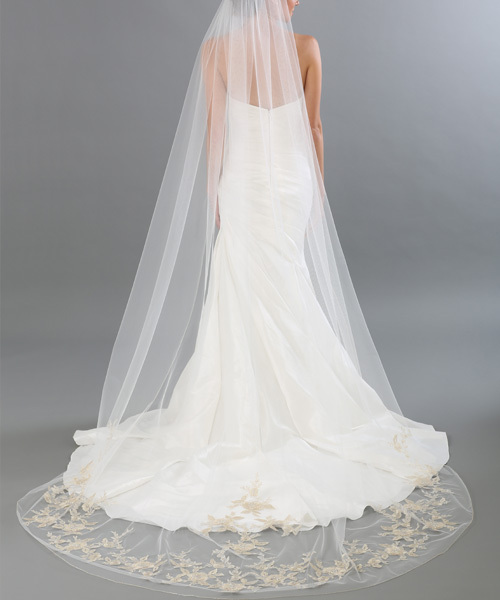 A 2-tier metallic rolled edge veil flows to waltz length, with metallic floral appliqués dancing along the edge. This ethereal foldover may be worn back for silhouette-shaping style, or forward for a romantic walk down the aisle. Classic elegance meets modern style in V7277. A 1-tier metallic rolled edge veil with metallic floral lace appliqués gracefully falls to fingertip length. This lovely design evokes the beauty of a garden with its gilded leaves and roses. Pair it with a gold headpiece and jewelry for an utterly enchanting ensemble. Style V7270 embodies pure elegance. 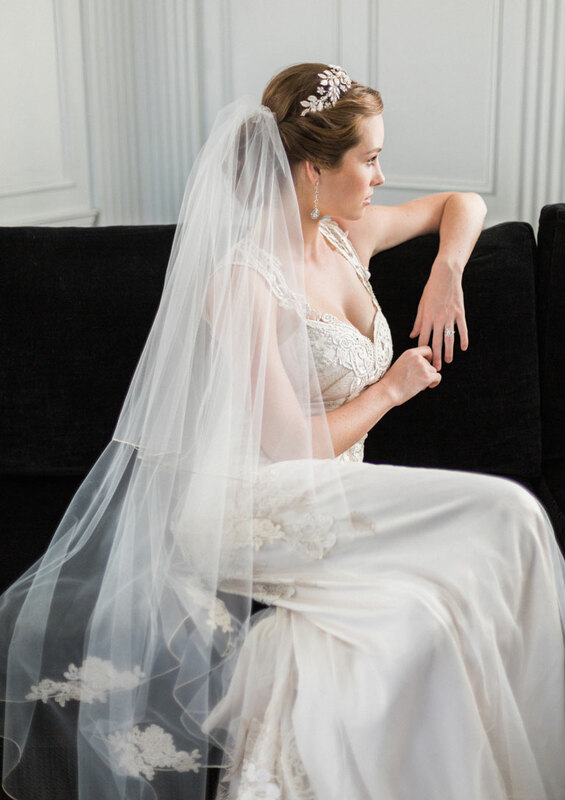 A 1 tier fingertip veil with metallic rolled edge and metallic floral lace, this vintage-inspired design blooms with rich detail. 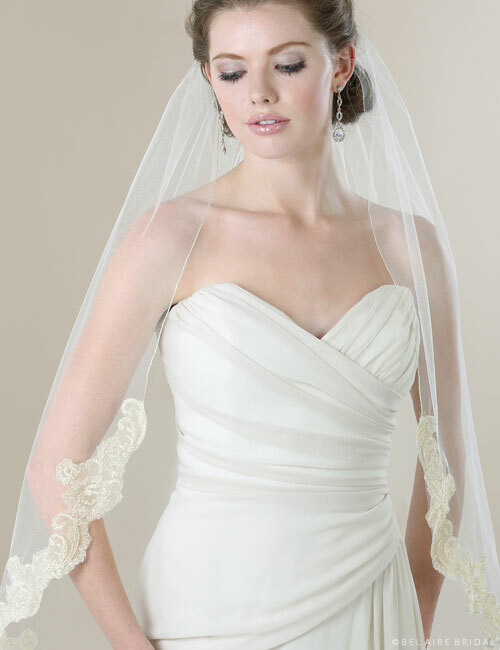 Scalloped floral lace along the curve of the veil creates a feminine aesthetic lustrous in its beauty. Pair it with classic drop earrings or a golden floral comb for a posh, pretty look. Is there anything more eye-catching than an incredible cathedral veil? Style V7287C features the same gorgeous lace appliqués as style V7277, but in an ultra-romantic cathedral length! Blissfully beautiful metallic lace gives your ensemble rich color and opulence. Tie it in with your gown by adding a gold belt or headpiece for glamorous sparkle. Our most dramatic gilded cathedral design, style V7325C pulls out all the stops. A delicate metallic rolled edge and breathtakingly beautiful embroidered lace embellishes the edge of this scalloped design. Dramatic floral flourishes and the occasional sparkling rhinestone create an exquisitely gorgeous veil fit for any fairy-tale wedding. Want to see more? 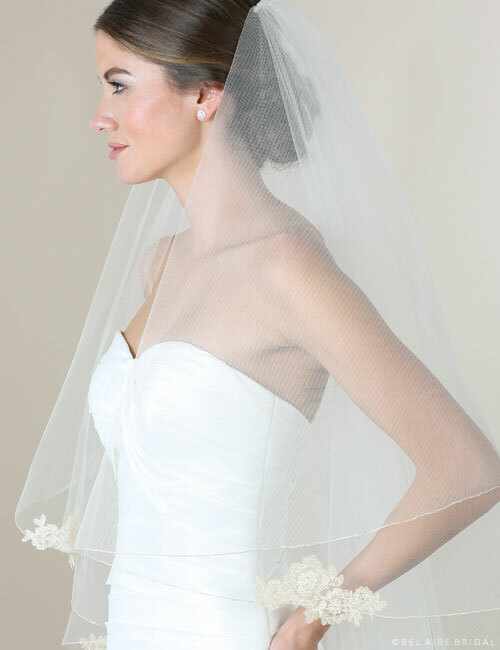 Check out our lace veils and cathedral veils pages for more options. Be sure to stop by our Fall 2016 headpiece collection or belts to create a total look for your wedding.